As Senate Republicans began holding votes to take away health care from tens of millions of Americans, Fox News’ Sean Hannity still chose to focus primarily on phony Clinton pseudo-scandals. Similarly, Fox’s Tucker Carlson Tonight focused on irrelevant and often offensive stories while largely ignoring health care. Even The Five, which did discuss health care at length, made time for a segment hyping Democratic frustrations with Hillary Clinton. Senate Majority Leader Mitch McConnell (R-KY) announced on July 24 that the Senate would be holding a vote on whether to proceed to debate on the various Republican proposals to repeal and, in some cases, replace the Affordable Care Act (ACA), which have been projected to take away health care from upward of 22 million people (“straight repeal” would strip away insurance from 32 million). On July 25, the Senate narrowly approved a motion to proceed to debate and then rejected the first plan McConnell put up to a vote. Despite the new actions on health care, Fox News’ prime-time shows focused nearly as much on bogus Clinton scandals and political intrigue as they did on health care on July 24 and July 25. 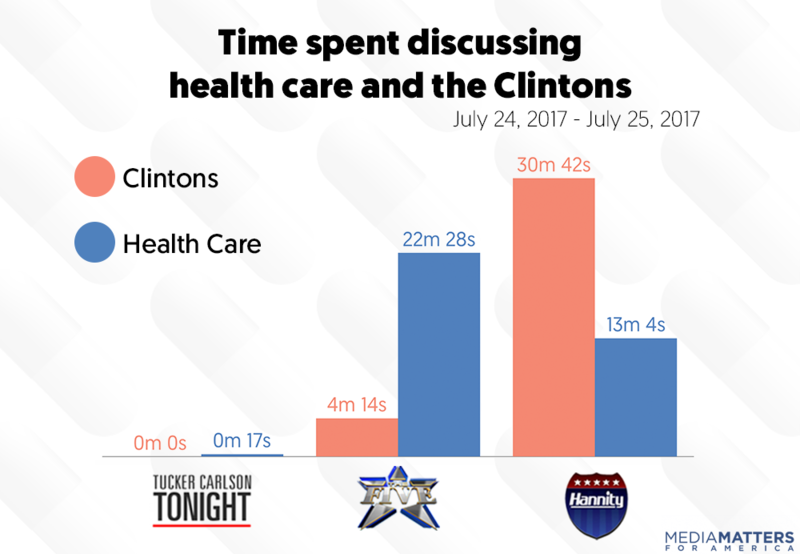 A Media Matters analysis found that Fox’s prime-time line-up of Hannity, The Five, and Tucker Carlson Tonight spent 35 minutes and 49 seconds discussing health care while devoting 34 minutes and 56 seconds to discussions of the Clintons. Of the three programs, Hannity’s coverage, unsurprisingly, was the most skewed. Over the two-day period, Hannity spent 13 minutes and 4 seconds on health care while devoting 30 minutes and 42 seconds to the Clintons. Even as senators were taking votes on health care, Hannity ran two full segments on the Clintons and spoke about health care in brief spurts of less than two minutes throughout the show. Meanwhile, while the Senate was voting on health care, Tucker Carlson avoided discussing it at all. On the July 25 edition of Tucker Carlson Tonight, the host went live to President Donald Trump’s rally in Ohio for 10 minutes and 57 seconds. Carlson did manage to spend 17 seconds on health care during his July 24 broadcast, which was mainly a video of Trump lamenting Obamacare. Instead of covering health care or the Clintons, Carlson focused his attention on stories that were either offensive or non-urgent. Unlike the other prime-time shows, Fox News’ The Five spent a significant amount of time discussing the health care bills. But the hosts also made time for a segment on Democrats criticizing Hillary Clinton. Media Matters searched SnapStream for mentions of health care, healthcare, Better Care Reconciliation Act, BCRA, Senate health, GOP health, or Republican health, Affordable Care Act, ACA, Obama care, and Obamacare, as well as Bill, Hillary, and Clinton on Fox News’ Tucker Carlson Tonight, The Five, and Hannity on July 24 and 25. Conversations were included in this study if health care or the Clintons was the stated topic or discussion or if two or more speakers in a multitopic segment discussed health care or the Clintons with one another. If a speaker mentioned health care or the Clintons in a multitopic segment and no other speaker in that segment engaged with the comment, then it was excluded from the analysis as a passing mention. All teasers of upcoming segments about health care or the Clintons were excluded from the analysis. The amount of time spent on Trump’s rally was calculated by monitoring it from beginning to end on Tucker Carlson Tonight. Fox is not a “news service” it is the propaganda arm of the Republican Party and/or Donald J. Trump. Republican failures, like the last 4(?) ObamaCare repeal votes, are disappeared. Positive events, like the Leader addressing his followers, get non-stop coverage. It’s why Fox viewers rank as the least informed. But why is anyone surprised? You could be right, but need to clarify your statement by adding . . . . “It’s why Fox viewers rank as the least informed” . . . of the lies of the Left. There is not such ranking of the “Least Informed” other than in your own mind and possibly in the FAKE NEWS, somewhere? We’ve, indeed, seen a preponderance of fake news in the recent months; most of it coming from sources within the White House. So sad. . . so sad. You know, Rich, Missouri is such a wide open space, it’s hard to see how you could live there & still be stuck inside the RWMO bubble. The studies are a few years old. Wonder if maddow has found another of Trump’s tax returns to make a fool of herself once again. She seems to be flustered when any of her accusations have document(s) to invalidate what she says? Not sure what you’re aiming at with that link. Suggest you review the comments on the Maddow/Trump Tax story. I said then that she chewed the story. But you know, that’s okay. ‘Cause unlike the RW, we can say our Leaders make mistakes. We can disagree with each other without resorting to Scarimucci level venom. “She seems to be flustered when any of her accusations have document(s) to invalidate what she says?” Suggest a re-write, that really doesn’t make sense. I’ve never had a problem with the “Fox” part. I do think that claiming to be “news” borders on false and deceptive advertising, thus coming under the purview of the FTC. But I recall back in 2006, Jon Stewart of the Daily Show, was polling as the Nation’s “Most Respected News Service”. Stewart himself joked about it. Simple math – Faux News viewers are hungry for anything they can hear negatively against President or Mrs. Obama or against the Clintons. Viewers mean ad revenue. If Hannity and Carlson had the same boring programs as CNN and MSNBC telling how much people (like the typical Fox viewers) were going to lose from the different GOP (lack of) health care proposals, they would turn the channel over to Bimbo in Bikini Wrestling, and the Murdoch clan would lose viewers (i.e. ad revenue potential). Fair and balanced, right? NOT! If Hannity and Carlson REALLY want to talk about past crooks….they certainly have nothing on Hillary…..they need to open up about how Dubya, Cheney, Rummy, and Wolfie caused the deaths of tens of thousands of our brave men and women in the military with their foolhardy and amoral invasion of Iraq. The only people who came out ahead in that fiasco were Halliburton(Cheney is still reaping monetary benefits from that incursion), arms makers and their share holders, and the defrocked Black Water bunch….the founder of which is the brother of Secretary of Education’s Betsy DeVos. Ahhhh….I just remembered. That war was started by a republcon, and Hannity and Carlson are loath to say anything negative about a republicon. And now, guess what? Donnie is thinking about sending thousands more troops into Afghanistan. Why anyone would want to serve in the military under a draft dodging commander in chief(That’s a laugh in itself) is beyond me. If he has his way the transgenders won’t be going to Afghanistan ???????? I read from a couple of sources this morning that it looks like the military brass is going to tell Donnie to take a hike on his ban on transgenders. Might start looking like Seven Days In May if that happens.